Dr. Robert C. Robbins, alongside the newly-appointed rector of Universidad de Sonora, Enrique Fernando Velázquez Contreras, renewed an historic agreement, enhancing the relationship between the UA and the prestigious Sonoran institution. A testament to his commitment to deepening relations with Mexico, Robbins welcomed to Tucson his counterpart and a delegation of officials from Universidad de Sonora, better known as UNISON. Velázquez Contreras of UNISON assumed his role as rector in June of 2017, the same time Robbins was sworn in as the UA’s 22nd president. UNISON, headquartered in Hermosillo, Sonora, was founded in 1942 and is ranked number five in the Mexico university system. The first formal agreement between the UA and UNISON was a shared commitment to advance geologic research and understanding, as well as mapping capabilities, in the Arizona/Sonora region. Having evolved multiple times over the years, the latest partnership specifically recognizes two projects, the first with the UA College of Science. The top two physics students at UNISON will be invited to apply for early acceptance to the graduate physics program at the UA, offering guaranteed conditional acceptance to at least one of the two. The initiative was born from the UA Summer Program “A Learning Research Experience,” where international undergraduate students explore life as scientific professionals at the UA. Faculty were so impressed with participating physics students from UNSION that they wanted to encourage them to return for doctoral studies. 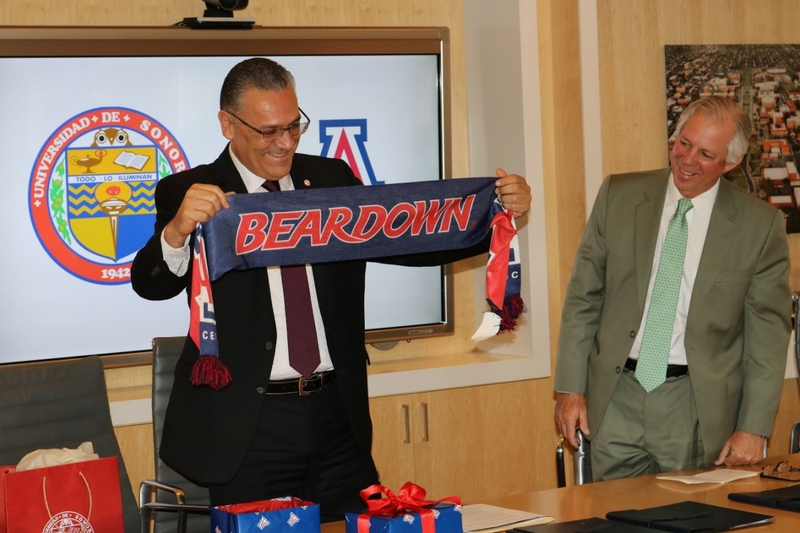 “We have a strong collaboration broadly with UNISON, and this agreement is a great way to memorialize what is already happening,” said Joaquin Ruiz, dean of the UA College of Science. The second project lies within the Indigenous Peoples Law and Policy Program at the UA James E. Rogers College of Law, a program Robbins recognized as the top of its kind in the US. “This agreement will actively engage students, faculty, and community stakeholders with respect to applied research and experiential learning opportunities for our students. These opportunities will focus on human rights, environmental science, and economic development,” said Robbins. James C. Hopkins, associate clinical professor with the Indigenous Peoples Law and Policy Program, applauded the initiative. “This is a watershed moment for Sonora and Arizona in the pursuit of indigenous human rights in the form of human and economic self-development,” he said. Robbins mentioned this agreement is a starting point to other potential collaborations. 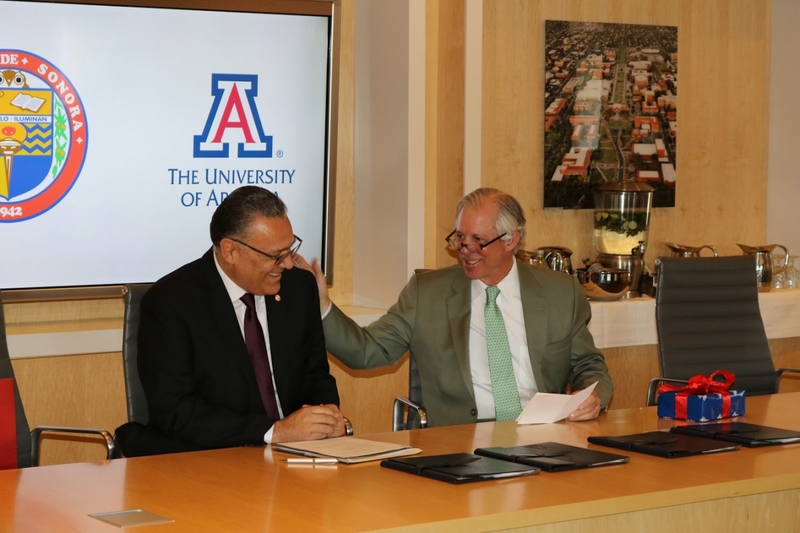 For the UA Office of Global Initiatives, this agreement signifies not only a strong bond between the UA and its neighboring institution, but also a solution to solve grand regional challenges. “For me, this is significant because we share a close geographic proximity with Sonora, as well as regional challenges. What better way to solve those challenges than to have an ongoing dialogue between our universities and, specifically, between scholars and students?” said Dale LaFleur, director of institutional relations with the UA Office of Global Initiatives.